Redknapp’s longtime assistant Kevin Bond was this week appointed manager of Southend United, who visit Highbury this weekend. Bond has worked with Redknapp throughout his coaching career and expects him to attend the Shrimpers’ remaining matches this season. Redknapp was at Southend’s training ground on Wednesday to oversee preparations for the Fleetwood clash. 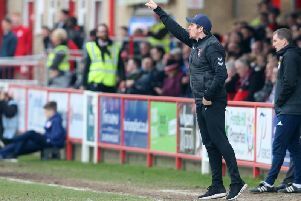 We will have to wait until Saturday to see if former Bournemouth, West Ham and Tottenham boss Redknapp is at Highbury to try to foil Fleetwood’s bid for three successive League One wins. Barton and Hill were both QPR players during Redknapp’s spell in charge from 2012-15, when Bond was assistant manager. Bond told the Southend Echo: “Harry is going to be a big supporter of Southend United. He came in to say hello today which was good of him. “He’s always been very, very helpful to me and I know he’s going to be really keen to see how we get on. “He’s someone I will lean on for sure and his experience will be invaluable.